Kovarik, William; Bernton, Hal; and Sklar, Scott. The Forbidden Fuel: A History of Power Alcohol. Lincoln, Nebraska: Bison Press/University of Nebraska Press, 1985 and 2010 (updated). Sheinkopf, Kenneth; and Sklar, Scott. Consumer Guide to Solar Energy. Fayetteville, Pennsylvania: Bonus Books, 1998. Scott Sklar is President of The Stella Group, Ltd. a strategic policy and clean technology optimization firm facilitating clean distributed energy utilization which includes advanced batteries and controls, energy efficiency, fuel cells, geoexchange, heat engines, minigeneration (propane/natural gas), microhydropower (and freeflow, tidal, wave), modular biomass, photovoltaics, small wind, and solar thermal (including daylighting, water heating, industrial preheat, building air-conditioning, and electric power generation). The Stella Group, Ltd. Is one of the very few companies that blends distributed energy & efficiency technologies and energy storage, aggregates financing (including leasing), with a focus on system standardization. Sklar founded the company in 1995 and joined it full time as its President in 2000. Prior, Scott Sklar served for 15 years simultaneously running two Washington, DC-based trade associations, as Executive Director of both the Solar Energy Industries Association and the National BioEnergy Industries Association. Before his move to SEIA and NBIA, he was Political Director of The Solar Lobby, a renewable energy advocacy organization founded by the nine major national environmental organizations. Before joining “the Lobby”, he was Washington Director and Acting Research Director of the National Center for Appropriate Technology (NCAT), founded by Senate Majority Leader Mike Mansfield and technologist EF Shumacher. This federally-funded applied technology organization assisted low income communities in utilizing energy efficiency and renewable energy. Sklar began his energy career as an aide to Senator Jacob K. Javits (NY) where he focused on energy and military matters for nine years. During his Senate tenure, he cofounded the Congressional Solar Caucus that lead many of the innovative legislation promoting renewable energy in the 1970’s. Sklar is co-author of two books, The Forbidden Fuel, published in 1985 and updated and re-released in 2010 by University of Nebraska Press, and theConsumer Guide to Solar Energy, which was re-released for its third printing. Scott Sklar serves on Boards of Directors of national nonprofits including, Business Council for Sustainable Energy (climate change) and The Solar Foundation, and Chairs the Steering Committee of the Sustainable Energy Coalition (national efficiency and renewable energy think tanks, industry associations, and advocacy groups). Scott Sklar lives in a solar home in Arlington, Virginia with solar water heating, geothermal heating & cooling, and photovoltaics/battery system. 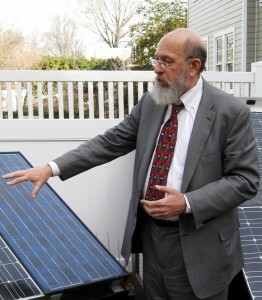 He has a unique PV system on the roof of his Washington, DC office overlooking Lafayette Park in front of The White House, and a zero energy VA office building with PV roofing shingles, small wind turbine, and a hydrogen fuel cell. Scott Sklar was selected as the Renewable Energy Industry Representative onto REEEP No Am Adv Committee of UN Int’l RE Activity in August 2006 thru December 2009. REEEP is a Public-Private partnership and was launched by the United Kingdom along with UN agencies UNIDO and UNDP, 30 other governments. Sklar was appointed in April 2007 onto National Advisory Council for Environmental Policy & Technology (NACEPT) of USEPA (ending January 2010). On November 4, 2010, Secretary Locke appointed Sklar to the Department of Commerce’s Advisory Board on Energy Efficiency and Renewable Energy, and was extended on December 4, 2012 by Acting Secretary Rebecca Blank., and once again Secretary Pritzker appointed Sklar to the Department of Commerce’s Advisory Board on Energy Efficiency and Renewable Energy where is serves as it’s Chairman, term ending June 2016. Sklar is an Adjunct Professor at The George Washington University teaching two unique interdisciplinary courses on sustainable energy, and an Affiliated Professor with CATIE, an international graduate university located in Costa Rica focused on sustainability for Latin America. And finally, Sklar heads two small non-profits: the Center for Small Business and the Environment, as well as The Global Solar Initiative.